... At night, the projector turns on, the big screen lights ... As part of a festival or other event an outdoor projection is always a pleasure of delight. Look our "hardware" and other pages under "Services" to get an idea of the possibilities. Ciné-Garrigues have a great experience of these events, please contact us by clicking here! The outdoor sessions can be organized for commercial or not. Any organisation of the traveling circuit can request a session outdoors for commecial. Technical support outdoor is three indoor sessions. the place have preserve public's safety and will not be accessible without paying the entranceticket. For the other municipalities, so in non-commercial, we conduct a technical inspection in order to adapt the conditions to our requirements. 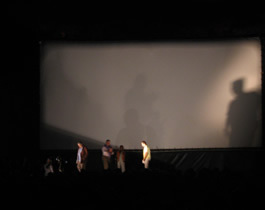 The choice of the film lies to the organizer. Rental prices of movies are different by title. A full quote is then proposed and signature commits booking the session. Return to the next page!